Lizzie Bassford led us in looking at the glory of the one who knows how many stars are in the sky and how many hairs are on our heads. She explored how we, as mums. can rejoice in our broken and messy world, seeing God at work in our lives and families. We long for our children to know for themselves the wonderful good news of Jesus and how walking with Him through life is the best way to live. This seminar helped us think about ways we can cultivate and nurture faith in our children. As our hearts rest in all that Jesus has done for us, we can joyfully join Him in his mission to build Kingdom. Listen to stories of ordinary Mums doing just that – everyday things that are making extraordinary differences in their families and communities. This was a creative workshop, giving space to express, through art and the creative re-writing of Psalms, the joy we can know through being united with Christ and trusting in His promises to us. Life changes dramatically when a new little person enters our world. Time, energy, capacity is stretched to its limits as we pour ourselves out in sacrifice for our little ones. 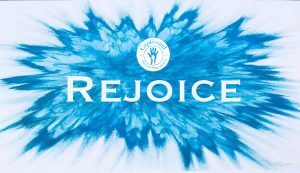 This seminar will helped us to consider ways we can keep Jesus at the centre of our lives so all our strength for this season comes from rejoicing in Him.